Do You Need A Tax Attorney? Are You Facing Tax Evasion Charges or Investigation? Tax evasion is where an individual specifically intends to underreport income or overstate deductions in order to get a tax benefit. It is more than an accounting error, it is more than an oversight. Your actions must demonstrate that you specifically intended to evade the law. When speaking with a tax attorney, your entire conversation is protected by the attorney client privilege. So it will never be repeated and the IRS cannot even force the tax attorney to disclose the information. It is also protected by the Attorney Work Product Privilege. Which means anything that is prepared by or for the tax attorney will not be disclosed and the IRS cannot force its release. Anything that you talk to the attorney about is confidential, even if you don’t hire the tax attorney. It’s still confidential and protected by the Attorney Client Privilege. The attorney is here to help you. The attorney will not tell your spouse, business partners, or anyone. All information disclosed will be kept between the attorney and client and no one else. What is the Difference Between Tax Evasion and Tax Avoidance? Tax evasion is a criminal act. Tax avoidance is a right. In fact Judge Oliver Wendell Holmes Jr. said that tax avoidance is perfectly legal and that you have the right to structure your affairs to pay the least amount of tax possible. The different is that with tax evasion you don't structure your affairs for the purposes of tax planning, but rather you underreport your income or overstate your deductions, make false statements on your tax returns in order to evade taxes, and that is a crime. When you think of penalties, you typically think of civil penalties such as incurring a financial debt. However, tax evasion is itself a crime. As a crime the IRS is interested in punishments that equate to time in jail. So, that means you will do time in a federal penitentiary. On the civil end, once you are convicted of the crime, then they will also go after you civilly and get the penalties and interest from you that way. So, tax evasion is something that can take a bite out of both your finances and your freedom. In these cases the best defense is to show that it was nothing more than an accounting error, a bookkeeping error or an oversight. This can reduce it from the level of criminal down into the civil realm. That takes a lot of time and energy to look at every act to build the case around why you did certain things in order to reduce it from criminal down into civil. Will the IRS tap my phone? It is highly unlikely. Unless you have been under investigation for over a year, and this is at least a $5 million case, the IRS will not go through the trouble to wire tap your phones. It is far too expensive and time consuming for them to listed to every one of your conversations. Even in the unlikely event that they do wire tap your phones, any conversation with the tax attorney must be deleted by them and cannot be used in their investigation. As soon as they hear words like “I am a tax attorney” the IRS has clear instructions that they must hang up and not listen to the conversations. The IRS truly does not want any of their representatives listening to conversations that are covered under attorney client privilege because it can completely ruin their case and cause, even a good case, to get thrown out completely. That is why a call to a tax attorney is the best call you can make. The most important thing is strategy. It's knowing how to set up your case. It's knowing how to structure your documentation in order to show that at no time did you intentionally misrepresent yourself by underreporting income or overstating deductions or that to the best of your knowledge you didn't make any false statements on the tax return. It takes a good strategy and a lot of effort to go into every bookkeeping entry, to talk to employees, suppliers and even customers to build a solid case that can be used to aggressively defend your rights against charges of tax evasion. 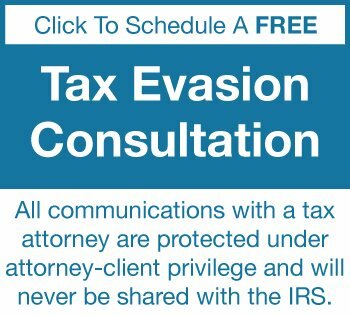 Are You at Risk For Tax Evasion Prosecution? Understanding the Tax Evasion Statute – Are You at Risk? Copyrights © 2013 & All Rights Reserved by William D. Hartsock, Tax Attorney Inc.